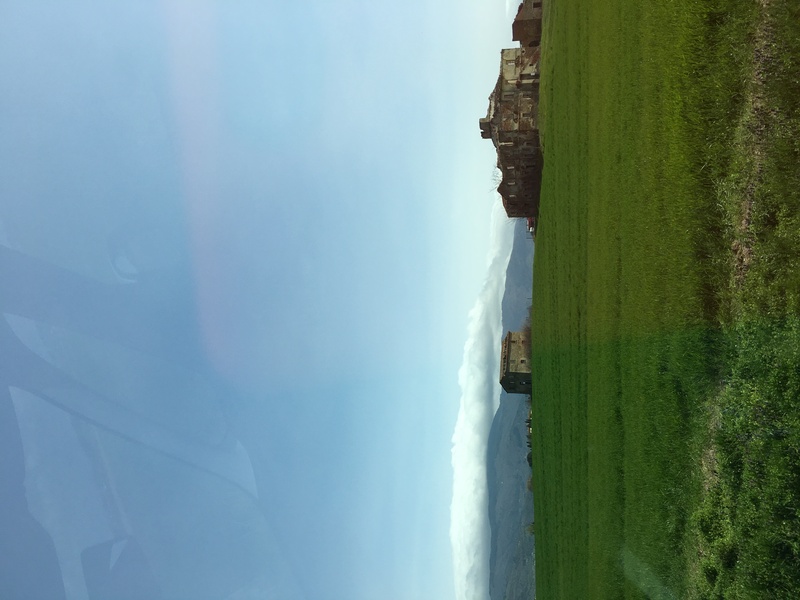 This photo, taken from the car window as we zoomed across the valley toward Cortona shows how green it already was here at the end of March. The house is one of the Leopoldini structures built in the 1700s to house farm families. With all the mania for restoration, I’ve never understood why these places haven’t been scooped up. People used to say it was because it is too hot in the valley in summer and too foggy in the winter but now that houses are insulated, heated, and cooled, this no longer explains. Arriving at Bramasole, I found my hillside of double daffodils almost over, and the white haze of wild hawthorne already turning out leaves. Market day in nearby Camucia is Thursday and even though I was barely here, I headed down hill my first morning. 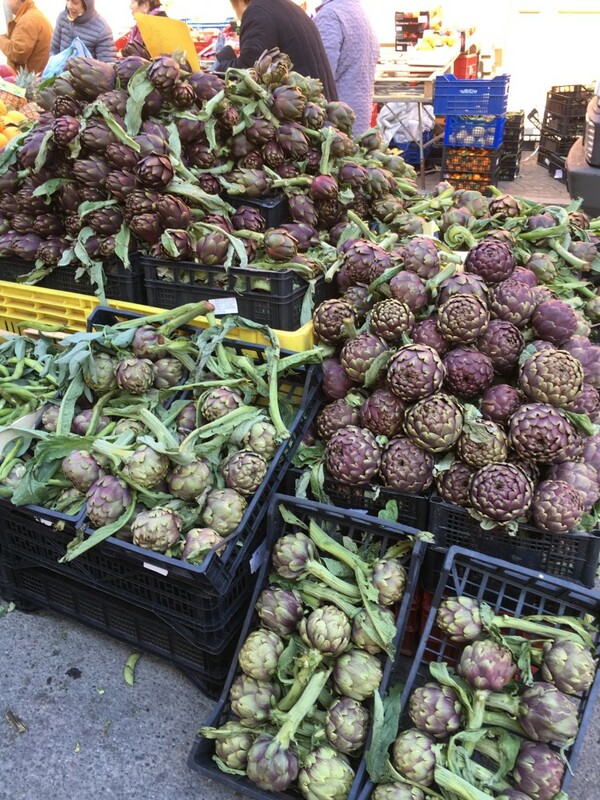 The very first piece I ever wrote about the Cortona area was this market. Little has changed. People still come in from the surrounding villages, the men stand in groups talking while the women shop, the stalls spread over several winding blocks. 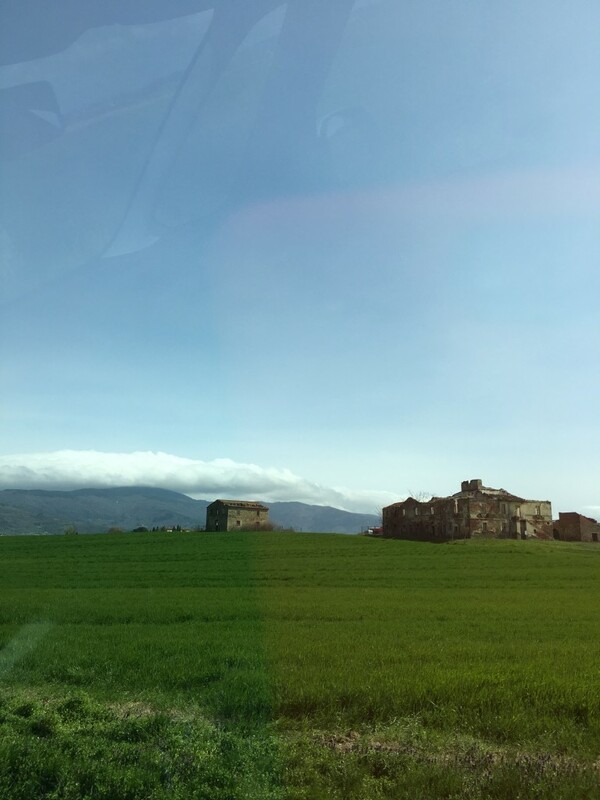 This is an intact aspect of ancient life in Tuscany. Towns still have their market days and though the goods may have changed aspect, there’s still food, seeds, live poultry, clothes, shoes, and housewares. You can find a stylish handbag, I promise. I buy socks, dishtowels, cut flowers, and always a peper-wrapped packet of porchetta, the so-savory roasted pig lying on a chopping board. Everyone has a favorite stand. I have a favorite cheese stand too, though I buy vegetables and fruit all over. Why I rushed there my first day back is that I knew that artichoke season is in full swing. 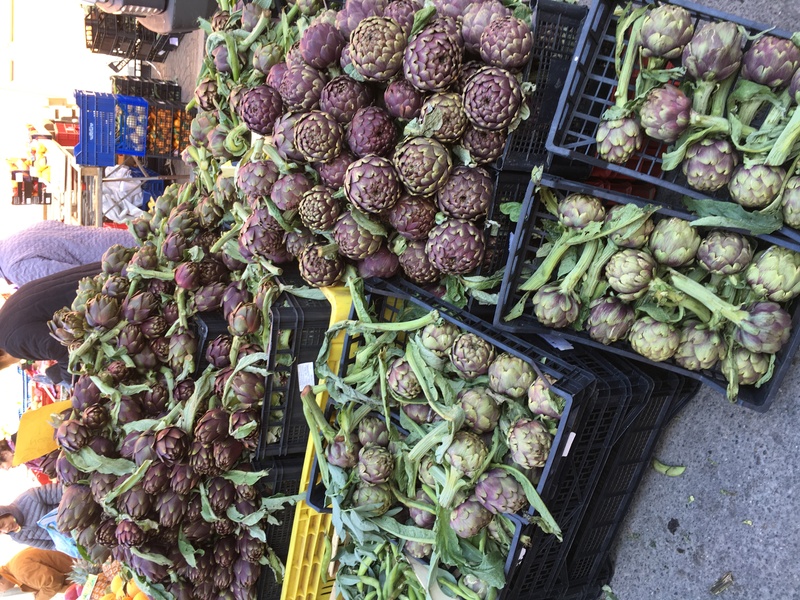 Trucks arrive from the south and the artichokes are firm, fresh, and so cheap. These are the big ones. The ones I choose are the small, violet ones to trim, steam, and simply dress with a little lemon juice and our very excellent olive oil. Then you can eat ten! The citrus is a gift to the eye. 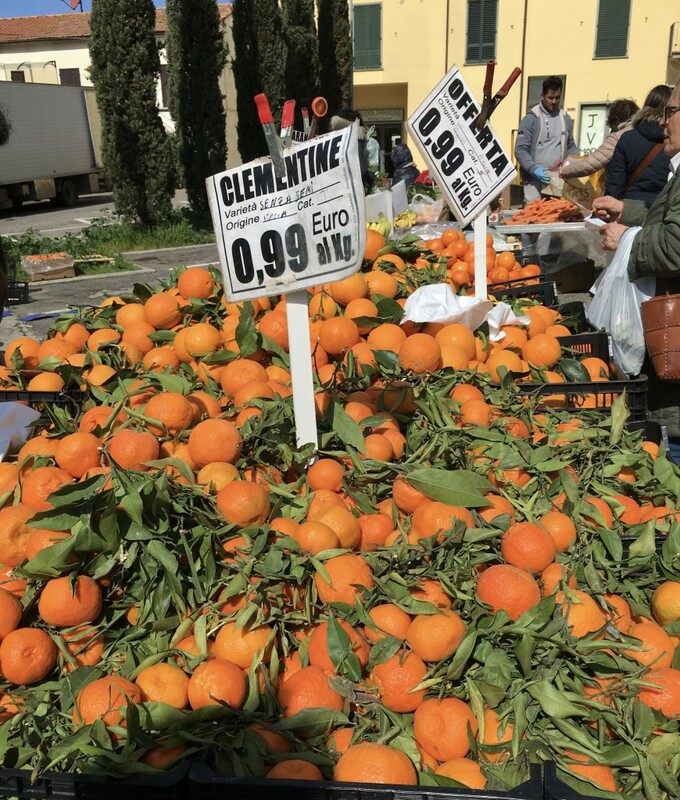 We look for the juicy Tarocco, plus clementines that Ed eats several times a day. I’m sadly allergic to orange juice but I like a blue bowl of these in the house at all times. Below, a lovely sight in spring–raw green almonds to crunch into. I think they’re an acquired taste–strong almond flavor but with an acrid little bite too. They are definitely part of the spring foraging scene. So pretty the soft green with hints of lavender. A very quick dinner, because we can get excellent veal scallopine here–saute (I can’t get the accent to work) some spring onions gently in olive oil until softened, slice 15-20 cherry tomatoes and add to the onions. Remove to a bowl and add a little more oil to the pan. Flour four veal scallopine and brown quickly on both sides. The flour becomes a bit crispy. Cooks quickly. Stir in the tomatoes and onions, squeeze in the juice of a lemon, tiny splash of white wine. Heat through quickly, sprinkle with parmigiano and bread crumbs. Done! Very good. We do the same with chicken tenders. I love fast food! This kind anyway. With the work over, it’s easy to settle in and enjoy glorious April. I hold off for two weeks before I begin to plant. Weather can still turn on us. But by the 18th, I can resist no longer. 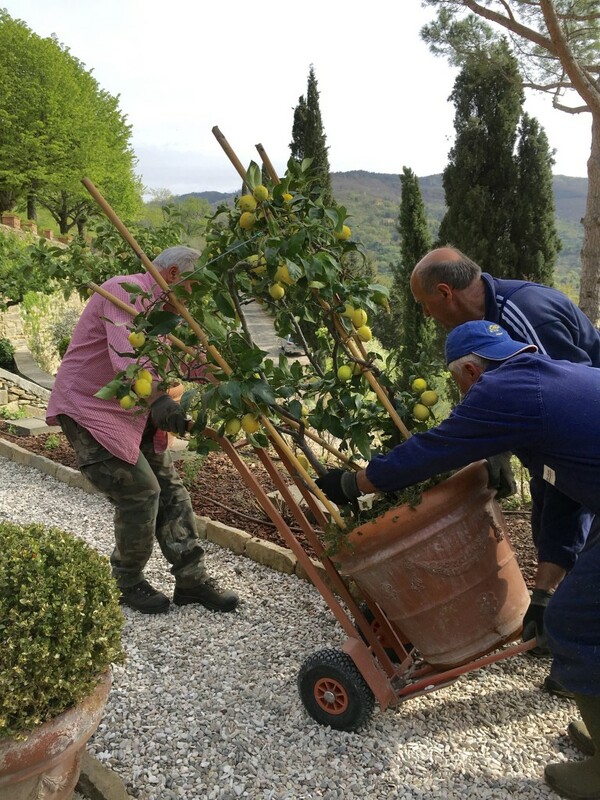 The lemons are brought out of their limonaia, the room where they winter over, and trips to the garden centers begin. Last year we had trouble with wind blowing over the lemon pots, heavy as they are. We had the stonemasons make square bases, scored with a cross for drainage. They were so heavy that they were hoisted up by a crane, lowered with much ado, and cemented onto the ground for stability. Oh, what we do for lemons! We had to build a ramp so they could be maneuvered down two steps. But in place, eight laden trees light up the walkway to the house and allow me to thrust a bag of lemons onto everyone who comes over. We have other citrus scattered around, an orange tree, a kumquat, a cedro. Turning them in for winter, bringing them out in spring–those are the markers that begin and end the lovely seasons. We frequently rent houses or apartments because we travel a lot with our grandson. Since he arises at five, a hotel room is not the best option. For me it’s not fun to look at hundreds of listings, so I was happy to find carefully chosen properties in all price ranges at www.commendablerentals.com Through them, we’re renting a place in Puglia with friends. I’m keeping this one bookmarked. We’ve also had good luck with www.RomeLofts.com For hotels, too, I don’t enjoy TripAdvisor popping up with a jillion undiscriminated choices. I go to tablethotels.com or to mr.&mrs.smith.com. Tablet has email updates on hotels around the world and I enjoy their descriptions. Since I’ve been chained to my desk, I haven’t read as much as usual this trip but I have enjoyed the short stories of Charles Baxter, A Relative Stranger. Every morning with cappuccino, I’ve been reading the poems of Greek poet George Seferis. Those Greeks–always mythic and stony and salty. Totally opposite the loopy Irish world of Joseph O’Connor’s Ghost Light. The writing here is so lyrical and heightened that I read passages several times. The narrative interested me less than the use of language. Two other widely praised novels I read were just so packed with useless detail (she opened the car door and swung out her legs, stood up and walked across the cracked sidewalk… that sort of thing) that I slogged through without much pleasure. No need to name them but they provided a caution for me in my own efforts! I most highly recommend the memoir Dimestore by the wonderful Lee Smith. It’s a book to buy and give to friends. On walks I’ve been listening to Sweet Tooth by Ian Mc Ewan. You have to choose audible books carefully and this is one I would have preferred in print. The discursiveness of it wsouldn’t have bothered me on the page because I could read fast or skim slow parts. The narrator has a lovely reading style but listening has been very drawn out. As always, I’d love to hear of good books from you!